On October 5, 2017, the U.S. House of Representatives passed a budget resolution that would open the Arctic Refuge to oil drilling. The Senate is poised to pass it soon after. Your help is urgently needed to protect “America’s Serengeti.” You can easily email your senators and congressman by clicking here. The Gwich’in, who live in Arctic Village on the southern edge of the refuge near the Brooks Range, have built their subsistence and their spirituality around the migrating Porcupine herd for thousands of years. The coastal plain on which they live is referred to in the Gwich’in language as the “sacred place where life begins.” The Gwich’in consider both the coastal plain and the caribou that give birth there to be central elements of their culture. The connection is such that every caribou is believed to contain a little human heart in it, and every human carries an element of caribou in his or her heart. The coastal plain, where oil drilling is proposed, is where the caribou give birth to their calves, and it has remained off-limits to hunting by native people as far back as any can remember. The Arctic National Wildlife Range was created in 1960 by President Dwight Eisenhower. In 1968, oil was discovered to the west along the coast at Prudhoe Bay and the native people on each side of the refuge were given a choice of giving up some of their land in exchange for oil profits or keeping the land untouched. The Kaktovik village residents to the north of the refuge chose oil money and have benefited from additional income for education, health and community services. The Gwich’in, on the other end of the refuge, chose not to compromise. They wanted to retain a more traditional lifestyle without financial assistance, and to “teach the world in a good way,” according to long-time Gwich’in activist Sarah James, who won the 2003 Goldman Environmental Prize for her work. This decision was made by the 7,000 Gwich’in people on behalf of the land and the 123,000 caribou who inhabit it. In 1980, Congress renamed the area the Arctic National Wildlife Refuge, doubled its size to 19 million acres, and designated most of it wilderness; however, it left future lawmakers the option of authorizing oil and gas extraction in a “study area” of 1.5 million acres coastal plain, the biological heart of the entire 19-million-acre refuge. To fight the continuing efforts to drill the Arctic Refuge, the Gwich’in people of Alaska and Canada called an historic “gathering” in 1988 to address the threat to their way of life. At the Gathering, they decided to establish the Gwich’in Steering Committee to work to protect the refuge. Changes in the presidency, increased militarization, and the damage caused to Gulf Coast oil refineries in 2005 by Hurricane Katrina left the Arctic National Wildlife Refuge more vulnerable to natural resource development. In August 2001, the U.S. House of Representatives passed the Energy Security Act, which included a call for oil drilling in the refuge. Senate Republicans attempted to attach that bill as a rider to the Defense Authorization Act, legislation pushed through the Senate following the Sept. 11 terrorist attacks. Fortunately, the Senate defeated this move in October 2001, and over the years since, drilling in the refuge has been repeatedly defeated in Congress, including attempts to link it to such unrelated appropriations as Iraq troop funding. Estimates on the amount of oil that might be obtained from the refuge vary from environmentalists’ estimate of 3 billion barrels to the government’s estimate of between 5.7 and 16 billion barrels. The lower estimate would only support U.S. energy needs for a period of six months to a year. Although the fate of the refuge has been caught up in rhetoric of energy shortages and high gasoline prices, if looked at from a long-term perspective, the amount of oil to be gained from the refuge is minimal compared to the country’s needs. It is clear that we must look at ways to reduce our consumption instead of invading pristine areas with relatively small amounts of oil. Raising the fuel efficiency standards on cars, light trucks and SUVs to 36 miles per gallon would save three times as much oil as the refuge could produce by 2020. The commonplace dangers of oil drilling — spills, toxic gases, machinery, the spider web of roads and pipelines — all mean that the energy industry would likely force caribou to go elsewhere to give birth, exiling them to places that lack adequate nutritional resources and protection from predators. 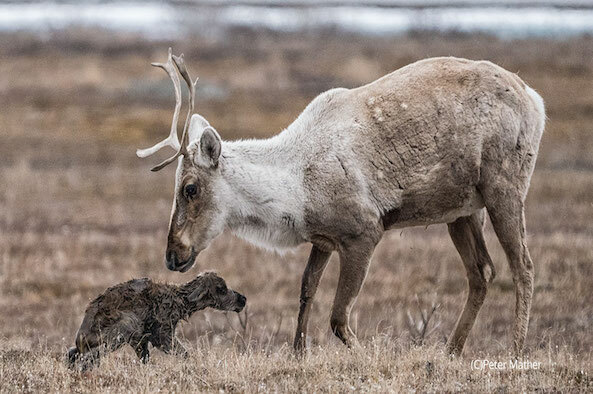 This could result in a 40 percent decrease in caribou birthrate, which would affect both the herd and the Gwich’in people. Other threatened animals include polar bears, musk oxen, wolves, and 130 species of migrating birds. Beyond the impacts on wildlife, oil drilling would intrude on an area long accorded respect by its human inhabitants. The Gwich’in have shown themselves willing to make financial sacrifices to protect land they consider sacred. In their view, oil drilling is not just about the specific effects on the caribou, but also their right to determine how to preserve the health of the land. Policymakers should consider the wisdom of those who have been the caretakers of the Arctic plains for generations. With the election of President Barack Obama, the official stance appears to have shifted toward one of greater conservation and the development of alternative energy sources. As reported by the Associated Press, Interior Secretary Ken Salazar said in March 2009 that protecting Arctic National Wildlife Refuge’s ecology and wildlife is “not something we’re going to change our position on” when considering future oil and gas production. “There are special places to be protected and ANWR is one of those.” In June 2009, Congress voted against a proposal introduced by Alaska Sen. Lisa Murkowski to open up the refuge to directional drilling, which aims to tap reserves within the refuge boundaries by drilling from the outside, but would not actually protect the delicate Arctic Refuge Coastal Plain from a network of industrial infrastructure..
Write to your Congressional representatives and urge them to support the Udall-Eisenhower Arctic Wilderness Bill (H.R. 1889 ), which would designate refuge’s coastal plain as wilderness and permanently protect it from oil drilling. Write your Senators and urge them to support the companion bill, S. 820. Sign up to help the Gwich’in Steering Committee. For more information, contact the Gwich’in Steering Committee. Also check out Oil on Ice, a documentary film project on the Arctic Refuge and the native people trying to prevent oil drilling there. Bolstad, Erica. “Committee Votes Against Directional Drilling in ANWR.” Anchorage Daily News, June 29, 2009. Coile, Zachary. “The Last Refuge: Caribou Migration, Drilling Plan Symbolic of Battle Between Oil and Environment.” San Francisco Chronicle, August 28, 2005. Coile, Zachary. “Arctic Oil: Oil is the Lifeblood of Alaska, With Residents Ready to Drill.” San Francisco Chronicle, August 29, 2005. Coile, Zachary. “Arctic Oil: How Much Oil Is Anybody’s Guess.” San Francisco Chronicle, August 30, 2005. Hebert, H. Josef. “White House Open to Directional Drilling in ANWR.” Anchorage Daily News, March 16, 2009. James, Sarah. “We Are the Caribou People.” Earth Island Journal, Summer 2002. Levendosky, Charles. “Report Raises Tough Questions About Drilling in ANWR.” Casper (Wyo.) Star-Tribune, October 2001. Murphy, Kim. “2 Villages, 2 Views of the Dynamics of Oil.” Los Angeles Times, April 16, 2001.